Spain is located in south-western Europe, bordering the North Atlantic Ocean and the Mediterranean Sea, between Portugal and France. The country covers a total area of 505,957 sq km. Spain has 4,964 km of coastline. Besides five other places of sovereignty on and off the coast of Morocco, Spain consists of 17 administrative regions (explore them here), 15 of which are on mainland Spain. 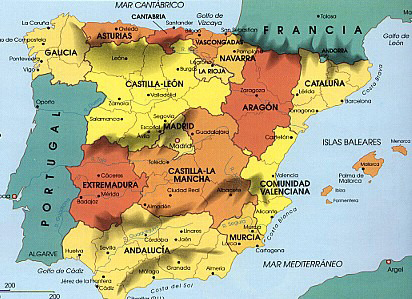 Spain occupies four-fifths of the Iberian peninsula and is a land of immense geographical diversity. What does Spain offer ? Spain offers the tourist and visitor a great deal. Spain's coastline has long since been a magnet for visitors but in recent years more and more people are spending holiday time, exploring beautiful and cultural Spain, away from the sea and sand. Spain has everything from lush, green forests and mountain ranges, through to endless arid plains and long, sandy beaches.